Everyone on Graham's couch last night was brilliantly honest. 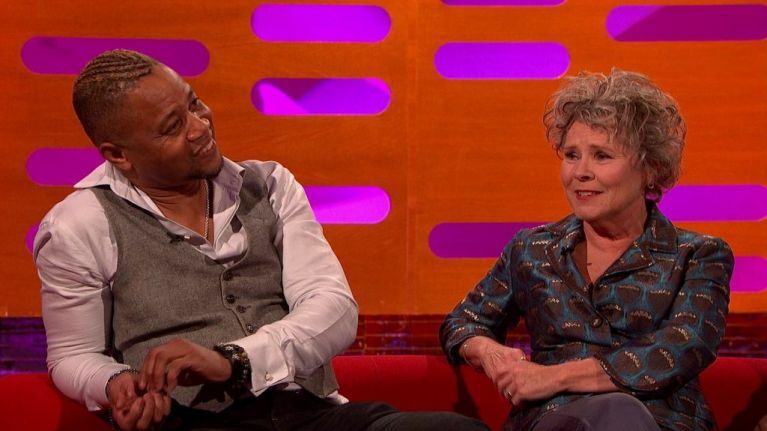 While it wasn't exactly Tom Cruise and his Mission: Impossible co-stars, last night's couch on The Graham Norton Show was just eclectic enough to stir up some great stuff. Cuba Gooding Jr was in town to promote London's West End new take on Chicago, with Cuba playing Billy Flynn (the part Richard Gere played in the movie), while Imelda Staunton was chatting about her new movie Finding Your Feet. With Gooding Jr an Oscar-winner (Best Supporting Actor for Jerry Maguire) and Staunton an Oscar-nominee (Best Actress for Vera Drake, which she ultimately lost to Hilary Swank for Million Dollar Baby), they both had amazing versions of their nights at the Academy Awards, and they are far from the glitz and glamour and well-behaved and respectful behaviour you'd expect. Not to be outdone, their couch-mate will.i.am was also there to chat about the latest season of The Voice. However, while the rapper/producer/host has found fame in his own right, there were plenty of earlier opportunities back in the day that could have launched him into the celebrity stratosphere at a much younger age, and his almost-collaboration with Michael Jackson (and his mother's reaction to the news) is one for the ages.